Almond milk is one of my favorite drinks — it goes great with everything! We’ve been buying it from Trader Joe’s lately as it’s the cheapest place we can find it at $1.29 a quart, but still, that’s expensive when you go thru a quart in a day or two for morning smoothies! 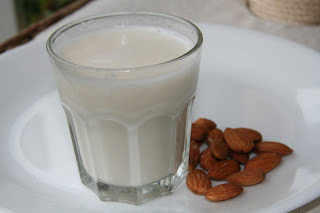 Did you know you can make almond milk right in your own home?? Rich and creamy, it’s easy to make and super nourishing. Cut down on the cost and take control of what is put into your almond milk by trying this recipe at home! While almond milk is a good alternative beverage for those on the Maximized Nutrition meal plan, a dairy-free kick or even a raw diet, I think it’s just plain delicious and you should give it a try no matter your dietary preference! I usually drink it by the glassful, but it’s also great in tea and smoothies or even for baking or cooking. Making almond milk is super quick but just a little messy. You will definitely get your hands wet as you squeeze and strain it thru the cheesecloth. That extra effort is SO worth it! My absolute favorite way to enjoy this rich, gluten-free almond milk is in iced chai tea with a sprinkle of stevia. Serve and enjoy, or bottle in a glass container and store in fridge up to 10 days. Any way to give it that flavoring, especially chocolate, that so many of the store brands have? What a fabulous idea for a post! I’ll get right on this… look for some info coming on the main homepage in about an hour or less! :) Thanks Lo! I just made almond milk for the first time, any use for the almond mixture that is left over? Yes! You can store it in the fridge and use it to sprinkle over salads, soups, add to smoothies. You can also dry it out at room temp on cookie sheets lined with a tea towel or paper towel — let air dry for 24-48 hours stirring occassionally. If you have a dehydrator, use that. after drying, use it as almond flour.